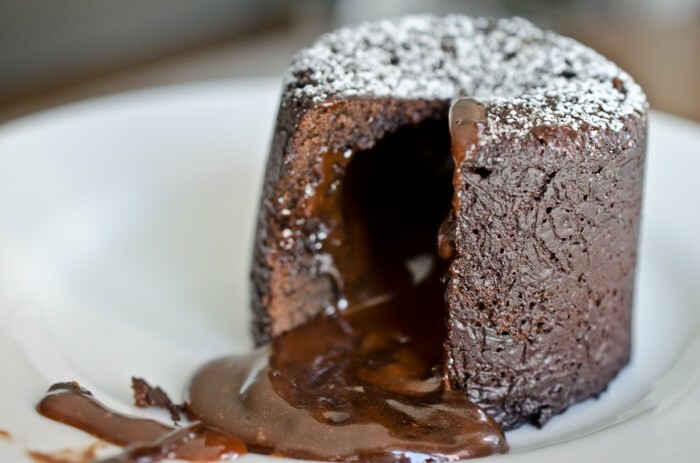 The first time I made this chocolate recipe it came out looking more like chocolate molten lava pudding. Of course, there's nothing wrong with pudding, except if you have 8 guests that have paid to eat at your supper club and what is on their plates looks like a big pile of brown mush. Then it's not such a good thing. I definitely had a ‘what the hell do I do now' moment when I pulled the ramekin off the cake and the whole thing oozed all over the plate except for a thin crispy crust. For a moment I thought I would simply call it molten lava pudding. Instead it got scooped back into the pan and all 8 of these little cakes spent a little more time in the oven. Still not quite enough time; they weren't as pretty as the one here in the photos. Didn't seem to matter as all 8 slightly too molten-y lava cakes disappeared, except for the few streaks of chocolate on each plate. 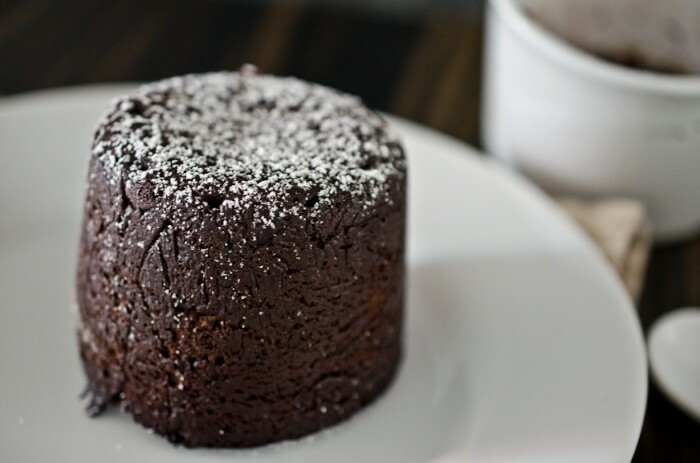 I put one of these cups of chocolate lava cakes with salted caramel away in my fridge so that I could share it with you. Wasn't that thoughtful of me? You might think that I was doing it so that I could also have a bite of it, but that's not true. I've been trying to be healthy and eat things like avocado cucumber salad and black rice salad with mango and cashews; chocolate lava cake wasn't supposed to be part of the plan. But then I cut a piece out of the side so I could photograph the chocolate lava pouring out. And then that little piece was just sitting there and all this chocolate molten lava and salted caramel was oozing all over the plate. I was left with no choice; it had to be eaten. If you make Chocolate Lava Cake with Salted Caramel make sure to snap a pic and tag @theendlessmeal on Instagram so I can like and comment on your photos. I love seeing TEM recipes you create. 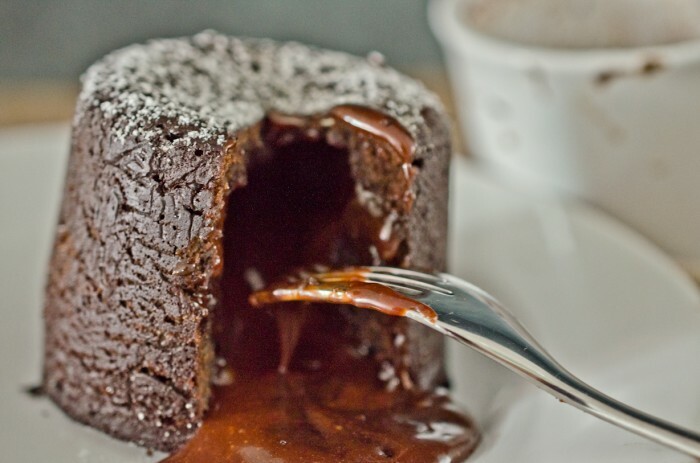 Chocolate lava cake is a simple but super decadent dessert. You can easily make it ahead of time and then pop it in the oven just before you want dessert. Heat mixture over medium-high heat until it is dark amber in color and reaches 350 degrees. Remove from heat. All at once add the whipping cream. Be very careful as it will steam and bubble ferociously. Whisk the mixture until the bubbling stops and the mixture is smooth. Add the chocolate and whisk till combined. Stir in butter. Melt the butter and chocolate in a double boiler or a metal bowl over a pot of simmering water. Whisk the eggs and egg yolks together in a large bowl. In a medium-sized bowl whisk together the flour, powdered sugar, salt and optional black cocoa powder. When chocolate has melted (allow it to cool for several minutes if it is hot) add it to the eggs and stir well. Then add the whisked flour mixture to the egg and chocolate and mix until smooth. Fill each ramekin halfway. Then, place a small tablespoon of caramel on top and sprinkle with salt. Cover with cake batter until 1/2 inch from the top of the ramekin. Preheat oven to 420 degrees. Bake for 15-20 minutes. Remove from oven and run a knife along the edges of the cake to loosen. Hold a plate over the top of each ramekin. Using oven mitts, turn the plate and ramekin over together so that the ramekin is inverted on the plate. Carefully remove the ramekin. Repeat with remaining ramekins and dust with icing sugar. The cake is delicious both with and without the salted caramel. To clean the pot you made the caramel in, fill it with water and put it on the stove till the sugar has once again melted. 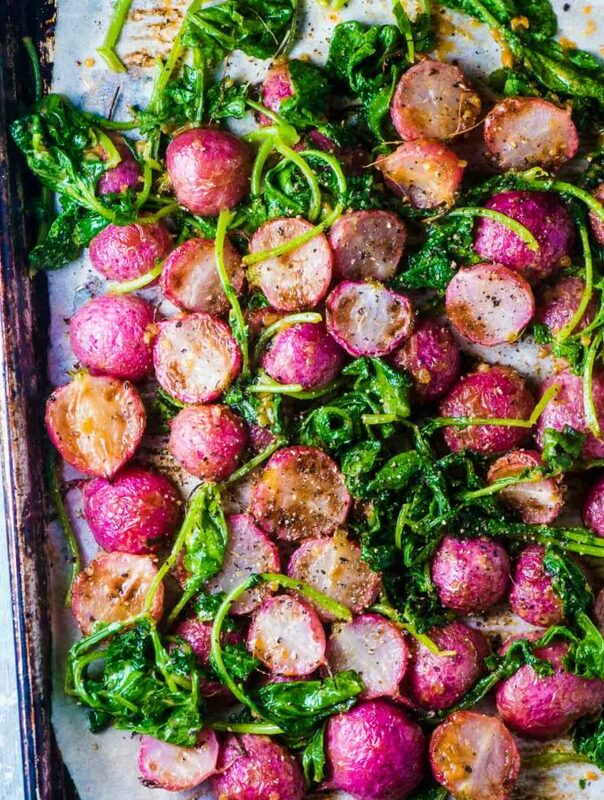 These can be made up to three days ahead of time. Store filled ramekins in the fridge and bring to room temperature before baking. The baking time can vary considerably depending on the size of your ramekins (see story above). If this amount of cake batter fills many more than 4 (please please) reduce the amount of time they spend in the oven so they do not cook all the way through! No Baking Powder or rising agent? Hello, is it possible you could tell me the recipe in grams please? I would be very grateful thank you. I have never measured the recipe in grams before so I wouldn’t be able to tell you accurately. I have made it many times before using cups/tea/tablespoons and it works out great every time so there must be some leeway in the recipe. 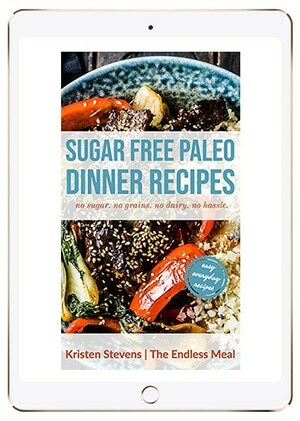 So excited about this recipe! I just burned the caramel. Is it 350 degrees for sure? What am I doing wrong? Don’t worry, you’re not doing anything wrong! Caramel can go from an amber colour to burnt in about a half a second. Also, if your thermometer happens to be off even just slightly this can happen too. At about 320 degrees the caramel will be a light brown colour and move to golden brown as it reaches 350. If you’re finding it is burning (it has happened to me too!) try taking it off the stove just a little earlier. Once the bubbles settle down you can get a good look at the colour and you can always pop it back on the heat for a second or two if you want it a little darker. A chocolate lovers dream! A definite must try! hi, I’m a bit confused – is this recipe for 4 ramekins or 8??? Thank you! I re-read this post and can see why it is a bit confusing. I had doubled the recipe to make enough for the 8 people that were at the Supper Club that night. The recipe is actually for 4 ramekins. Check to see what size yours are before you fill them though, mine are 3/4 cup and a bit bigger than most I think. If it turns out your ramekins are smaller than mine, make sure you decrease the cooking time. I wonder if you could make these with just salted caramel without the chocolate…..
You’re allowed to cheat on your diet sometimes, but keep up the good work! Being healthy makes you feel so good! This is making me drool! I couldn’t print this recipe fast enough! Hope you love it as much as I did! Oh my ! Dripping with deliciousness !! 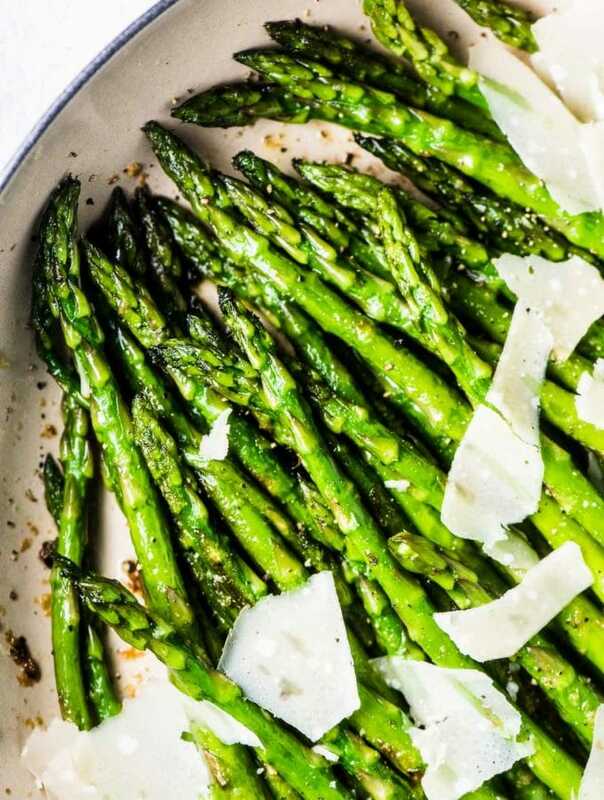 I know I won’t be waiting for any dinner party to make these…..what fabulous photos ! It would have been a shame not to eat of this gorgeous oozing cake! Oh my… I try not to convince myself why I should make it this weekend… I need to eat healthy, too! 🙂 Beautiful pictures! I don’t blame you for taking that bite, I can barely resist licking the computer screen! These look wonderful! Lol some things are completely impossible to resist!